We hooped and we hollered and got on our way. Driving that herd up to Dodge is the plan. 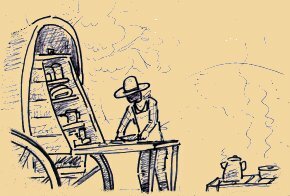 The Drover, ten cowboys and the chuck wagon man. And a bedroll to sleep in after a big juicy steak. Chasing down stragglers was driving me crazy. and fresh from the coals was a big pot of Beans. and them beans in my belly was starting to ache! I saddled my horse and got the cows out of bed. choking on dust and smoking old stogies. He will serve our next supper neath a kerosene lamp. and straight from the coals was a big pot of beans. hard work was ahead of us for thirty more days. Our chuck wagon was trampled we said not a word. Ole cookie was angry so he came up with this. Tortillas and butter, but (thank you) no beans! But thinking of whiskey since the day we were hired. Cause cookie is working, and fixing the one. After a month of them beans, we need a nice break! Just thinking of supper, "I can't stand the pain"
and straight from the coals was a big pot of beans! There are modern conveniences and a kitchen at last! And for supper at night is the Dairy Queen! We sleep in motels and have Trucks that we lease. So remember ole' cookie, may he rest in peace!